Emmitt Smith was an absolute force this past season as a senior for the Pinkerton Academy football team. He was extremely dangerous when running the football, lining up in the slot and catching passes out in space or when returning kicks. Smith is one of the fastest players in the state and also has the elusiveness to break tackles and get to the second level of the defense. On Tuesday 'Slippery Smith' officially committed to Bentley University on a 4 year athletic-academic scholarship. Bentley is Division II school in Massachusetts which competes in the Northeast-10 Conference. This is a great accomplishment for Smith, who helped the Astros win the Division I state title in 2010 as a junior. On Wednesday he'll be signing a National Letter of Intent to play for Bentley, but on Tuesday he took the time out to answer some questions for the NH Notebook on his commitment in an exclusive interview. Here's what he had to say. Emmitt Smith: The factors that led me to choose Bentley were that I was searching for a university that had high academic standards, along with quality competition on the football field and that is exactly what Bentley brought to the table. In high school, I put just as much effort in the class room as I did on the football field, so I really took academics into consideration when I made this decision. 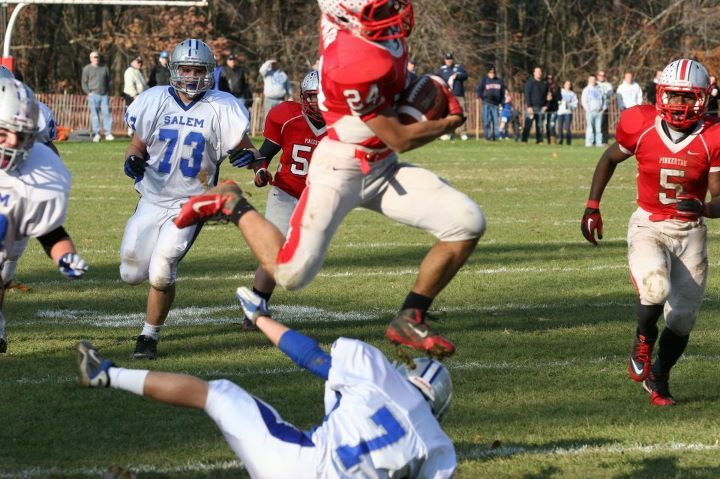 JL: Talk about your overall experience playing football at Pinkerton and helping them win the title in 2010. ES: I would not be sending this e-mail to you if it wasn't for my experience at Pinkerton. I loved it, and our junior year was very special winning a championship after I was a part of many tough championship losses in my football career. I never have been closer with a group of guys as I was that year, and that same feeling was evident in my senior season even though we didn't seal the deal, I couldn't ask for more in my years at Pinkerton. JL: What do you see your role being on the team at Bentley? ES: I hope to evolve as an offensive weapon at Bentley in any facet, and contribute in special teams as a returner, but realistically, I am going to Bentley to do whatever I can to help my new team, and hopefully keep their winning tradition alive. All I know is that it is going to take a lot of hard work and I will be willing to do whatever it takes. JL: What has helped your speed and overall development as a player? ES: I worked with Joe Dudek in the summers, and it was treated almost as a running camp, and that undoubtedly helped me progress on the field, and helped me better utilize my speed. Also programs like Complete Athlete in Derry were instrumental into my advances on the field. The thing that helped most with speed however, was probably the fact the I stopped playing baseball after Freshman year to do track in order to maintain and enhance my speed, and that really paid off. JL: What do you plan on studying at Bentley? ES: I hope to utilize the amazing business and finance school Bentley has, and pursue something in those fields. More specifically like corporate finance, however this is still subject to change at this point. I do know my direction will be toward business and finance, and that Bentley is the perfect school to fill these aspirations. Congratulations to Emmitt, and best of luck at Bentley!